The Complete BackCheck™ has long been a benchmark for pre-employment screening in Canada. In some industries, The Complete BackCheck™ reveals red flags on 60% of candidates. Because you never really know which background check service will reveal a red flag, it is best practice to choose multiple employment screening tools. Protect your employees, customers and shareholders. Fully compliant with Privacy, Human Rights and Freedom of Information legislation. Results within 24 hours or less. Over time, credit bureaus collect name, address, employment and alias information about candidates. Cross-reference this data with details provided by candidates on BackCheck consent forms. 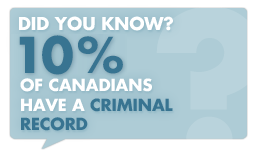 Reveal more criminal histories by inserting aliases into the criminal record search. Verify dates of employment, positions held, and reason(s) for leaving directly from payroll and Human Resources records. All information obtained is cross-referenced with the claims on the candidate’s consent forms. We know how, when, and who to contact for timely results. Verify the candidate's highest level of education directly with listed institutions. A consistent, auditable, high quality process. Eliminate the chance of 'phone tag' as professional reference interviewers are available during extended business hours. Reveal financial pressures - "Desperate people may do desperate things." Poor payment history or collections may indicate irresponsibility. Uncover history of County Court Judgements and bankruptcies. A Complete BackCheck™ is worth more than the sum of its individual services. Our trained professionals analyze and cross-reference each document, looking for inconsistencies, exaggerations, and other red flags.